I won a scholarship to the school in 1938. I travelled to Mansfield from Edwinstowe on the Ebor bus, a double decker. Upstairs were boys and girls from all three grammar schools. The school extension was just opened and we wore ‘ward’ shoes to protect the floors. I took sandwiches for lunch and paid 6d a week to sit in the dining room, use the cutlery and get a glass of water. When war broke out the government decided to give all children school meals when rationing started to ensure they got a balanced diet. Soon we shared the school with one in danger from bombing. We studied in the morning and had games in the afternoon. For the February half term, when Mansfield had ploughed up their flower beds we planted potatoes. 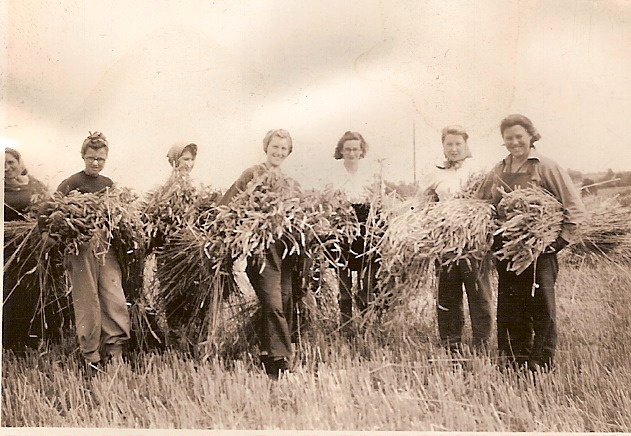 An elderly man gave us a bucket of potatoes and told us to “…take a step and drop one, take a step and drop one…” When we were in the fifth form I volunteered to go harvesting for the war effort. We went to a school in Lutterworth where we slept on palliases in the school hall. We were assigned in twos to farms and stoked corn, and then we were given a pitch fork to load them on to the hay carts drawn by horses. Because my Mother always kept me a dinner for when I got home after having had a school dinner I put on weight and was 11 stone at 15. Near the end of the fifth form our careers advice consisted of a talk by the Head on teaching, a talk by the Matron on nursing and a talk by the Librarian. These were the choices for those without money to go to University. I chose teaching because my Mother had told everyone after I received the scholarship “…Margaret is going to be a teacher…” I suppose I was brainwashed but I think it was probably the best choice. I am still giving talks on the History of Edwinstowe. I was clearing out some drawers recently and came across my school report book from QEGGS, most of which said ‘Jennifer could do better’, plus an autograph book which many of the people named above had signed as we started to go our separate ways in 1970, but also some new ones. I was at QEGGS from 1965 to 1972 and can vividly remember going through those gates for the first time in my uniform ‘that I would grow into’! In the second year some of my friends and myself were taken to task as we were playing marbles in the quad, NOT the done thing for young ladies to be playing, but it didn’t stop us. Looking through I have autographs from Sue Abell, Penny Evans, Sue Green, Elaine Stanbury, Janet Orwin, Gillian Unwin, Lesley Ward, Anne Mellor, Linda Fowler, Christine Burney, Cherry Dugan, Jane Hartley, Anne Mellor, Josephine Kinsley, Angela Turner, Helen Southcott, Stephanie Cheetham, Judith Bingham, Angela Geeves, Irene Dennett, Sheelagh Zuerner, Elaine Smith, Jane Ceney, Maureen Tunney, Vivienne Webster and Anna Auzins. Anybody out there who recognises any of these names? I was in Greyhounds and enjoyed athletics, although I was regularly beaten into third place by Sandra Hadfield, (Falcons), sadly I believe Sandra died several years ago, she married one of the Troop family (market traders), and Barbara Michalek, (sorry if I’ve spelled this wrong), I think she was in Dragons. My maiden name is Jennifer Frost in case anyone is wondering. I apologise in advance to Maureen Tunney who I now understand is Head at Garibaldi School, but I feel I must share her entry. I attended Queggs 1963 -1969. I remember being very in awe of Miss Batty the headmistress, Mrs Bolland at the piano for Assembly, Mrs Ratcliff who taught English, poor Mr Jowett who tried to instill Latin into us with weekly tests, seem to remember most of us “cribbed” from the text book & fooled no-one! Miss Wilkinson in Cookery,my Mother used her Christmas cake recipe for many years. Miss Rawson for PE that I adored, I think Mrs Beastall was Deputy Head at that time. 1st & 2nd year in The Cedars, sewing in Elmfield & poetry competitions somewhere in Mansfield. I remember my year in 6th form as the best, white braid on blazer and much hated beret! That went in the pond in the Quad on the last day! I visited Mansfield for the 1st time years after leaving school & was sad to find the School gone. Names I can recall include Margaret Cant, Susan Turner,June Beaumont & Pat Norman. I was at Qeggs from 1965-70. I have very many happy memories of the school from being a first year in Cedars. I remember Mrs Bonsall playing the piano in the school hall, the wonderful school song, the school houses- Greyhound,Falcon, Roses, Dragon,the Standing Salt. Playing tennis after taking exams-there must have been at least 12 tennis courts! The covered way leading to the dining room. The fabulous library. Trying to learn to play the cello! The school rules,one of which we weren’t allowed to wear long white socks! Doing my needlework in Elmfield. All the science labs particularly the Biology labs with specimen jars,the source of endless fascination.I remember all the teachers listed above as well as Mr Bell, Miss Germany,Mr Newton, Mr Fawcett. People I remember-Cherry Dugan,Linda Kirkham,Susan Green,Susan Abell,Lesley Green,Angela Turner,Sandra Hadfield,Gillian Unwin,Jane Ceney,Vivienne Webster,Linda Fowler,Maureen Tunney,Helen Southwell. Happy days! I was at QEGGS 1964-1968. I recognise the names above. A few years ago I was on election duty at Garibaldi School where I met Maureen Tunney who was headmistress. I was at Queggs from 1965 – 72 along with friends Sandra Hadfield, Jean Harrison, Maureen Tunney who remain close friends of mine. I remember Cedars and Elmfield, Miss Batty, Mrs Kent, Miss Oldham, Mr Maw, Mr Pepper, Miss Starmer, Mrs Thomas (geog), Miss Fever, Mrs Moffatt, Miss Williamson, Miss Starmer, Miss Rawson, Mrs Birkett, Mr Plant and Dr Duckmanton to name a few. Other friends I’ve lost touch with were Elaine Stanbury, Liz Vickers, Gill Unwin. I was at QUEGGS between 1971 and 1976 and my brother David Tuckwell was at QUEGS Boys School two years earlier We lived at Croft Avenue, Mansfield as kids. I now live in New Zealand. I have fond memories of the school which I believe has now gone, memories of Mrs Batty headmistress, Mrs Baker dinner lady. The hall was amazing, we held a Bay City Rollers concert and we all went mad. One incident was of five naughty girls who pushed the dinner lady into the Quad pond – Carol Tuckwell, Deb Vincent, Jayne Leatherland, Theresa Purseglove and Maxine Turner – we were aged fourteen (love u girls) – Sorry Mrs Baker.